Rally is an ever-changing game of numbered directional signs providing twists and turns taking each team through a variety of obedience exercises. Each judge is his own course designer, following venue regulations, from novice to advanced to excellent level courses. The courses vary from show to show, making training and trialing competitive. Special thank-you to Sandi Ling for her assistance in developing this course. image: Sandi and Babe at a rally fun event. 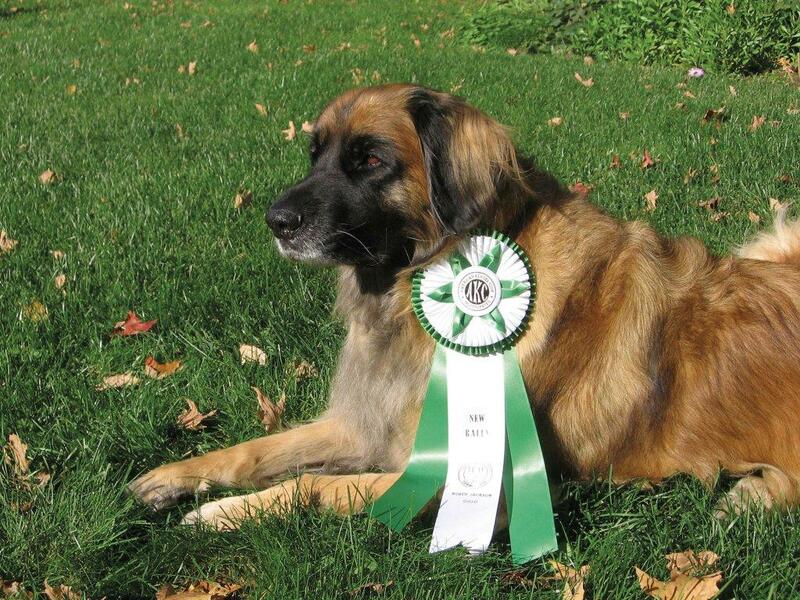 Emmy was one of the first, if not the first, Leonberger to receive the AKC Rally Excellent title. The Association of Pet Dog Trainers (APDT), the United Kennel Club (UKC) and World Wide Kennel Club (WWKC) were among the first to offer rally as a titling event. The American Kennel Club soon followed and by 2005 dog owners across the country were participating in rally obedience trials in a variety of venues. Rally appeals to both dogs and handlers alike with more Leonbergers competing in rally each year. Midrea's Love Of My Life (Ming) participating in the Denmark cup of Rally-O. It is important that exhibitors be familiar with the various venue rules and be aware that individual dog registration may also be required before entering a competition. The first AKC level, Novice, is performed with the dog on leash, while the Advanced and Excellent levels require the dog to work off leash and include a jumping exercise. In AKC rally, there are 29 stations for novice level, from which a judge may select 15 to 17 for a course. Additional, more intricate, exercise stations are added for advanced and excellent levels. All novice stations may be utilized in advanced and excellent courses. Exercises #32 through#45 may be used in advanced and excellent, while exercises #46 through #50 are only used in the excellent class. Rally is truly a heeling course among consecutive numbered sign stations. Each sign describes what is expected at that station. All red stop-signs indicate the dog must sit at heel position. Arrows and descriptive wording give the handler further direction to complete the station. 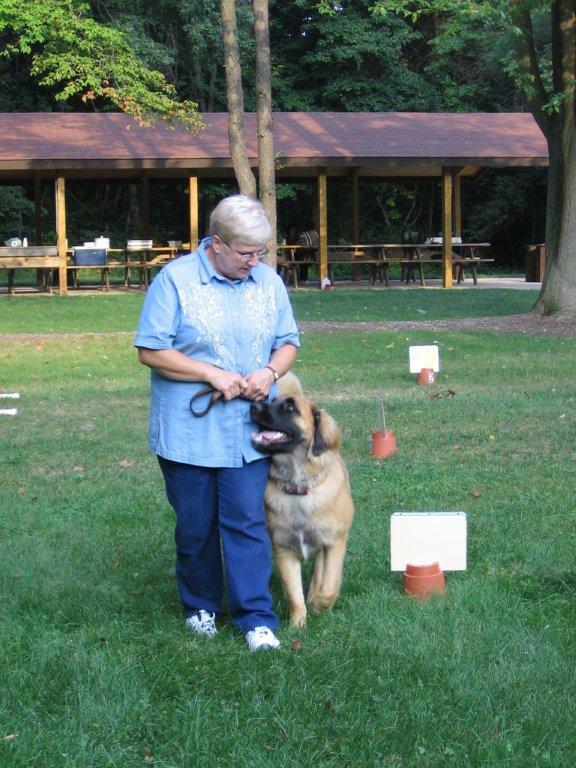 Each dog and handler team performs individually with no group exercises as in traditional obedience competition. The Halt-Sit-Walk Around and the Halt-Down-Walk Around exercises are done in much the same manner as the obedience group sit and down exercises, only as an individual exercise. A dog must qualify three times, under two different judges, with scores of 70 points or higher out of 100 points, to earn the AKC rally initials RN (Rally Novice), RA (Rally Advanced) or RE (Rally Excellent) after his name. Cyrus, owned by Janet Dierson, obtains third Rally Leg for RN title. Many rally exercises are not found in traditional obedience, having originated in what were called “doodling” exercises in training classes. This positive practice keeps a dog focused with lively turns, pivots and quick recall exercises. What makes this sport so appealing is the ability to encourage the dog and praise while working the course. A big plus to all exhibitors is the “do over” which allows a team to repeat an incorrectly performed station (with point deduction) before moving on to the next one. Praising while working and repeating an exercise are not found in regular obedience. Although courses can include many of the same exercises, the sequence will not be the same from show to show or judge to judge. Judges design their own courses to flow from one level to the next by changing exercise signs from one level to the next. In the Advanced level one jump is included. Excellent level includes two jumps and an “Honor” exercise. The honor is performed on-leash with the dog and handler team doing either a sit or down stay, as directed by the judge, in a designated area, while the next dog completes the course. The Honor station is monitored by a steward. In theory each team enters the ring with a perfect score, errors along the course can lower that perfect score. Deductions range from 1 to 10 points off, an NQ (Non-Qualifying) or excusal from the ring. While verbal praise is encouraged during competition, touching the dog, dropping the leash, picking up or carrying the dog at any time on course, or harsh collar pops are prohibited. Handlers must empty their pockets of any treats while in the AKC ring. This also includes returning to the ring for qualifying ribbons. APDT rally does allow handlers to discretely offer a reward treat at the end of an exercise. At the conclusion of each individual run, the judge gives the score sheet to a table steward for tallying. Rally is also a timed event, with one steward running a stop watch from the start to finish signs. Individual scores are posted shortly following each run. Times are used to determine class placements and a run-off is performed in the event of a tied scores. AKC rally competitions are offered throughout the U.S. Other available venues, including APDT, are limited geographically. It is important to be familiar with the rules and regulations for each venue as they do vary. But most important is Practice, practice, practice! And Have Fun! You must learn to read the signs and follow their progression with your dog as your partner. Judges at Rally trials are usually very understanding. Here is an example of a Judge's Briefing Notes.